This fascinating short from Vitagraph shows a very innovative approach to trick photography and allows more direct interaction between actors than double exposure would have. Director J. Stuart Blackton brings a fantasy to life that has elements of Guy and Méliès, while also displaying a distinctly American style. 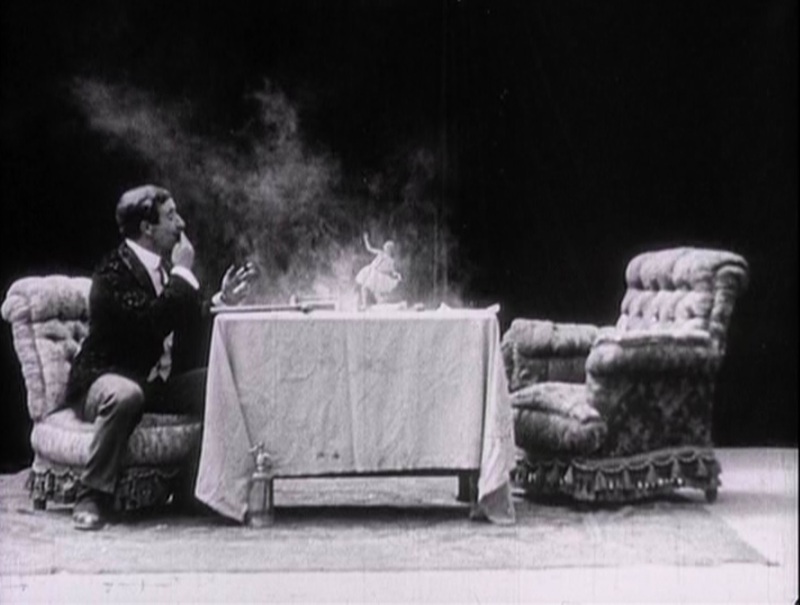 A man is in a room, preparing to smoke his pipe. Suddenly, he drowses off and falls asleep. While he is asleep two tiny figures appear among his smoking accoutrements – one a small child and the other, a grown woman, both in fairy costumes. They appear to be only a few inches tall. There is an edit, and we see them at closer range, moving among the oversized implements. The woman gets into the cigar box, and the child hides in the pipe, putting tobacco over herself in the process. The man wakes up and starts smoking his pipe, but he notices something strange. He shakes it out and the child tumbles out happily (apparently unconcerned that she was almost burnt up!). She and the woman dance on the table for a bit, and the man smokes and tries to trap them in the cigar box. When he looks inside, all he finds is a flower, but when he removes it, the child is there smoking a cigarette. Then, he gets up and leaves. Now, there is an animated sequence which shows the matches arranging themselves and then a cigar rolls itself out of leaves and tobacco. The man walks into what looks like a different room and finds the cigar, lighting it and also breaking a bottle that holds one of the fairies. He begins smoking and blows the smoke at the fairy, which seems to annoy her. She builds a bonfire out of the remaining matches, and he extinguishes it with a spritzer bottle. He then uses the spritzer to spray the fairy off of the table. As the DVD notes observe, there is a wealth of material here for a dedicated Freudian – even if “sometimes a cigar is just a cigar.” I alluded to the special effects, which were managed by shooting the women in a mirror at a distance that made it appear that they were small and on the table, rather than using double exposure and having to shoot everything twice. Keeping that technique in mind, this is a very interesting performance. I think the “different room” continuity confusion was a result of the trickiness of these effects: on a second viewing I noticed that most of the background was replaced with a black curtain starting just before the animated sequence. Possibly they were having difficulty getting the effects to show up against the original backdrop. For the insert shots, we see the fairies interacting with large props (a barrel-sized pipe bowl, and matchsticks the size of their legs, etc). I’ve seen claims that the first time this was done was for the movie “Dr. Cyclops” (1940), but here’s an earlier example and there may be more. The editing structure is relatively sophisticated, not just stringing together scenes, but allowing us to change our perspective on the action as it develops. The movie owes something to the French, in terms of its effects and overall tone, but there’s something quite unique in the subject matter and the ambiguous attitude towards smoking and tiny women.